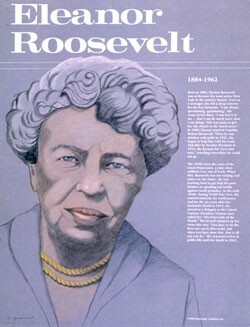 This educational poster of former First Lady Eleanor Roosevelt features a striking artist's illustration of her, as well as biographical text detailing her life and accomplishments. 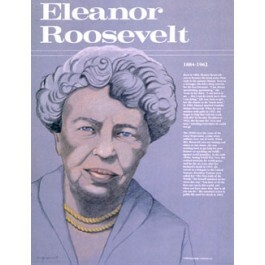 Eleanor Roosevelt, was the wife of President Franklin D. Roosevelt, and was one of the most active first ladies in history. She served during the Great Depression and World War Two and endeared herself to the American people by advocating for poor people, and against racial prejudice. She spent the rest of her life working for progressive causes and for world peace.